This Room Divider is great for sectioning off any space in any room and serves as a wonderful accent. The wooden frame of this room divider is finished in black with a contrasting lighter backdrop of panel screen. Double hinges allow the four panels to be folded in either direction. 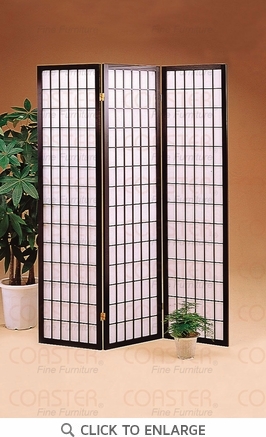 This Room Divider is an excellent item to have in your home. Dimensions: Width: 54" x Height: 70.25"